This well-equipped home offers resort-style living. The house opens on to a large entertainment patio with dining for twelve, jacuzzi, BBQ, Sports Bar and tropical pool area. Tiled living room with a new kitchen and breakfast bar opening on to an outside patio for intimate dining facing a colorful tropical garden. Large side patio for games. 5 minutes walk to extensive sandy beaches and the Atlantic Ocean with exclusive access key. The beach is protected by the Florida Reef, third largest in the world, after the Great Barrier Reef and the Belize Reef. The Florida Reef begins at the Hillsboro Inlet and extends south to Key West. Pompano Beach is the Eastern tip of Bermuda Triangle. This house sleeps 8 in three bedrooms. (with one king size bed and three queen size beds. Crib available and a roll away bed on request. All bedrooms have TV. Two bathrooms en suite and an additional toilet. Two outside showers. New fully equipped kitchen. Indoor dining area equipped for 8. Living room with TV. Breezeway with sports bar and big screen TV. Cable TV with premium movie channels, free Wifi, free local phone service. ADT Security System. Back patio with outdoor tables and seating for 12. Seating next to jacuzzi, pool and bar. Side patio with outdoor dining table by landscaped, colorful, tropical gardens. Very private backyard and pool area surrounded by privacy landscaping. Other large, paved side patio for games. Heated outdoor pool (18' x 12'). Jacuzzi for 4. Includes yard, pool and jacuzzi service. Key provided for private access to one of the largest, most beautiful sandy and safe beaches in South Florida overlooking the inlet Lighthouse, jet-ski rentals, kite surfing and deep sea fishing boats. Pet - friendly (with additional pet deposit). Two bicycles provided with helmets. Full laundry facilities. Newly redone, beautiful bathrooms in Master and third bedroom. Half bathroom also available and two outdoor showers. A bit dated but satisfied all our needs. We had a great time , the house is perfect for large families and the pool and hot tub are perfect! Highly recommend! Scott and Amy are the best, take care of all your needs with a positive attitude . Thank you Scott and Amy !!!!! Great location by the beach! Our group of six enjoyed our stay! The house has everything you need, comfortable beds, beautiful outdoor space and close to a private beach. Loved walking to the beach and to the lighthouse inlet park. Pool is heated, so the kids could swim even on chillier days. Owner was very responsive to issues we had with the hot tub. Thanks for a great stay! The house is so good! I really appreciated everything. In house have everything that we needed. The house is so good. In house have everything that we needed. The pool is so good and warm. This is a quiet little rental. We loved staying here. The property is well maintained and the property handyman lives close by. We enjoyed staying here and would do so again. The house was really roomy and in a great neighborhood. Short walk to a beautiful beach! I would come back! 5 minutes walk to extensive sandy beaches and the Atlantic ocean with an exclusive access key, Deep Sea Charter Boat and Intracoastal Flats Boat Marina and other water sports, jet skiing, pier fishing, snorkeling, scuba diving, kite surfing, convenience store, deli, Italian restaurant, pizza and Chinese food. 5 minutes drive to two public golf courses, tennis courts, indoor bowling, local flying lessons, 18 theater cinema, other retail, fast food and fine dining restaurants. 20 minutes from Las Olas Blvd. or Boca Raton for upscale dining and shopping. 30 minutes from the Hard Rock Seminole Casino. 40 minutes drive to outlet shopping. One hour's drive to the Everglades for alligators or bass fishing. Two hours drive to the Keys. Three hours to Disney World. 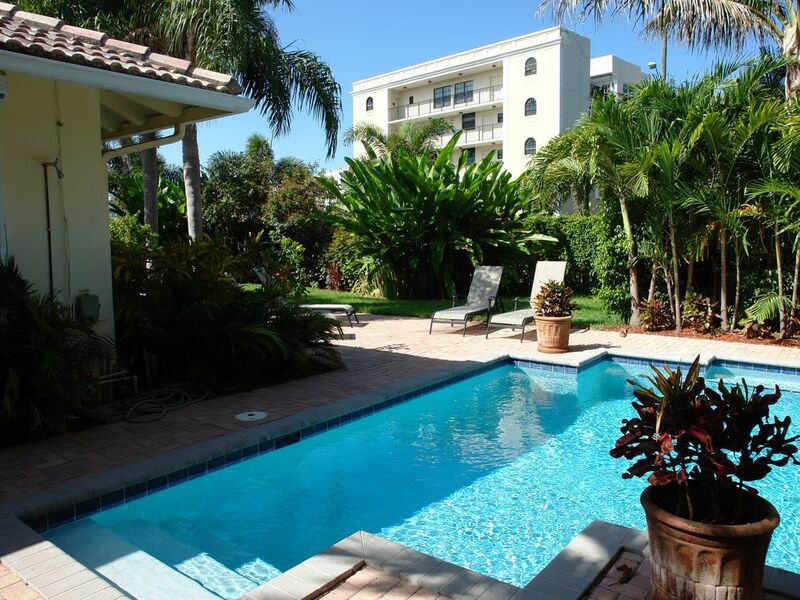 Golf: 5 minutes drive to two public golf courses at Pompano Beach. Cost $70 for two including cart rental. 50% deposit due at the time of booking. Fully refundable if reservations canceled one month prior to first night stay. Owner has final approval of all rental agreements. Reservations not confirmed until deposit is made.